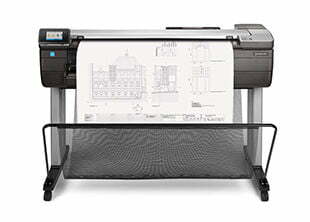 A plotter is an industry term that describes a large-format printer that is used to print directly from CAD and GIS applications. These printers are widely used in by architects, mappers, construction workers, manufactures and engineers. Midshire specialises in plotters from HP, the leading manufacturer for plotters in the UK. If you are searching for the best place to purchase HP plotters, look no further than Midshire. We have been awarded HP Gold Partner Status, as well as becoming a fully accredited DesignJet Production Specialist Centre for our expertise on supplying and servicing all HP large-format printing equipment. We have an extensive portfolio of industry leading plotters available. No matter what your requirements, whether you are looking for a machine to handle GIS or CAD and print in A1 or A0, Midshire has a plotter for you. As a HP Gold Partner, our experts will happily provide you with our recommendations based on the budget and operational requirements of your business. There are many advantages associated with HP Plotters, including the fact that they are fully featured, so you benefit from maximum versatility. You will have the ability to print up to four D/A1 size pages per minute on up to 600m of media, ensuring you reach optimum levels of productivity. The print quality is also outstanding, making these printers the ideal choice for technical documents, plus you can fully integrate your workflow and cut prep time by up to 50 per cent thanks to the HP DesignJet Smart Stream software. In addition to all of these benefits, you can expect to see real cost savings as we give you flexible finance options to either buy a machine outright or lease it over a term that is best for you (typically 3 – 5 years). There are efficiency savings to be made too, as accessories such as online folders and external stackers can save you time and money. We don’t just supply you with the plotter and then leave you to it; Midshire offer a complete service and support package as well, which is integrated in our unique Ink Inclusive Contracts. We are able to do this thanks to our independent status, as well as the fact that we are one of a very small number of dealers that has been specially selected to supply and service HP equipment. If there are any problems with your printing equipment you can rest assured that we will endeavour to rectify the issue as quickly as possible, after all, we appreciate that there is no time to waste in business.